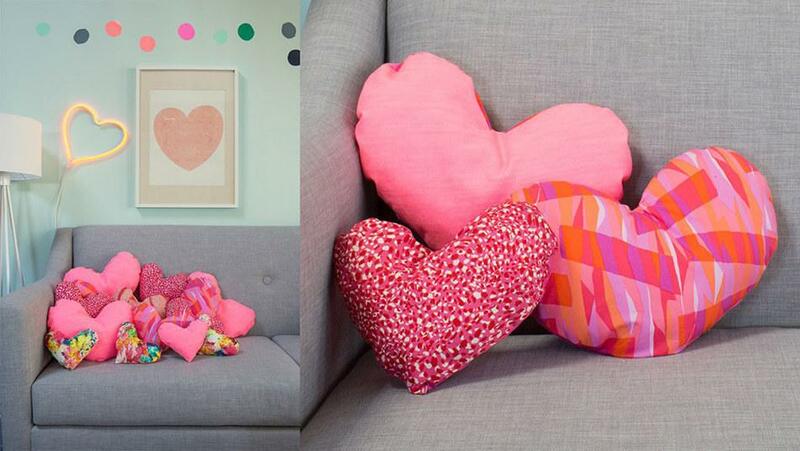 These darling little pillows are an ideal project for those with little experience in sewing. No difficult patterns or instructions, just an easy and fulfilling craft to keep or give as a gift—perfect for Valentine’s Day, Mother’s Day, or any heart-worthy occasion. A sewing machine is optional for this project. Ours were stitched by hand, which is a wonderful way to teach children to sew. However, hand sewing takes patience, so take breaks if needed. Designs in this project were also hand sewn. 1. Lay your fabric down flat on your work surface. 2. Fold over one time, then fold over one more time in the same direction so that the fabric is now doubled up. 3. Using a pair of scissors or pinking shears, starting from one side of the fabric cut out half of a heart shape so that when you open your fabric you should have two equally sized hearts. 4. Lay your two hearts so that the right sides are facing each other, the wrong side of the fabric should be facing out. Use straight pins to secure the two pieces of fabric together, lining the pins around the edge of the fabric, about a three-quarter inch in from the edge. This will secure your fabric but not be in the way of where you need to sew. 5. Begin at the bottom of the heart and stitch evenly around the edge, about one-quarter inch in from the edge. Stitch all the way around the heart until you have almost completely closed it. Leave approximately one-and-a-half to two inches open but do not cut or tie off thread. You will need it to finish off the heart after it is stuffed. 6. Remove all the straight pins that were securing your fabric. 7. Very carefully, turn your stitched heart “outside in” through the opening. Now your fabric should be right side out and should resemble an almost completed heart. 8. Using your fingers inside the heart, gently make sure that all the fabric is pushed out where it should be. 9. Secure your needle out of the way be poking it through the outer edge of the heart, away from the opening. 10. Using small pieces of cotton batting, gently stuff your heart pillow until all areas are full and the pillow is firm to the touch. 11. To stitch the opening, fold the two seams of the opening of the fabric in to match the rest of the heart. Stitch the opening closed. 12. As a finishing touch, use a long piece of colorful ribbon and tie into a bow. Hand stitch on to the front of the heart and trim the bow ends to the desired length. For our red heart, we used pinking shears and stitched around the outer edge with the RIGHT sides of the fabric facing outward. This was done purposely to give a decorative edge to the heart. There was no need to turn the fabric “right side out,” simply stuff and close it up.For our pink heart, follow the instructions outlined above, however, to add lace, line the edge of the lace sandwiched between your to pieces of fabric. Stitch through the fabric and the lace following this pattern all the way around the heart. Before you begin, you can picture what this will look like by holding the lace and the fabric between your fingers and then folding one piece of the fabric back to view your lace. Be sure you have the seam of the lace lined up with the seams of the fabric. Choose fabrics that are vibrant. Lace goes wonderfully with plaids and florals while a solid fabric will look great with a striped or polka-dot bow. Using a pattern. A pattern is not needed for these, however, if you are more comfortable using a pattern, simply cut a heart from paper first to trace onto your fabric. Add a lovely scent. To make this a scented sachet you can add some scented potpourri in the middle of all the stuffing, or for a temporary scent, spritz with perfume.